This strategy game of cat and mouse will have players competing to bring home the cheddar. This unique, tabletop strategy game has two to four players taking on the role of hungry mice as they battle it out to determine who takes home the cheddar. 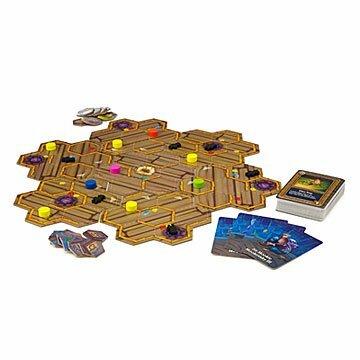 The game board is a twisting maze of walls and traps, cheese, and cats, with a different layout every time you play. Each player wants their mouse to be the first to bring two pieces of cheese back to the nest, while also sabotaging their competitors by manipulating the cats that are prowling the pantry. For example, send a mouse back to its nest with a Go Away! card, or move your own through a wall with a Squeeze card. Full of dramatic twists and with high re-playability, this game is sure to entice game lovers of all ages (and by all ages we mean nine and up. Created by Phil Schadt. Made in China. Phil Schadt is one of those amazing people who grew up to be the same person he was as a child. When he was young, he was amazed by the magic of animation; as an adult, he earned a degree in animation and computer arts from The Art Institute of Philadelphia. As a child, he loved introducing other children to board games, and making up games of his own; as an adult, he works for a start-up that teaches financial literacy through games. In his free time, he has combined those two loves by creating his own game that echoes the cat and mouse antics of childhood cartoons. I have played this game before, and knew right away that it would be the perfect gift for my sister I law. She is notoriously hard to shop for! I may buy a few extras just in case a last minute gift need appears.